Special top mounted buttons for additional control and increased realism in 3D games. Classic digital control for a wide variety of game play options. Z Button - Unique handle mounted trigger button provides and instinctive playing position. New Analog Control Stick for maximum game control. Reacts to the slightest pressure or the quickest move. Designed for a totally new experience in 3D game play. The primary buttons used for most games. Larger size for increased player comfort. These buttons work in a group for changing camera angle and view in 3D games or work independently for detailed game control. Left Position - For games using both the + Control Pad and analogue Control Stick. Right Position - For playing games using the new analogue Control Stick and the conventional buttons. Home Position - The classic controller layout for playing a wide variety of games. 05-03-2016 aliensstudios Box Text L+R Buttons Special top mounted buttons for additional control and increased realism in 3D games. + Control Pad Classic digital control for a wide variety of game play options. Z Button - Unique handle mounted trigger button provides and instinctive playing position. Control Stick New Analog Control Stick for maximum game control. Reacts to the slightest pressure or the quickest move. Designed for a totally new experience in 3D game play. A + B Buttons The primary buttons used for most games. Larger size for increased player comfort. C Buttons These buttons work in a group for changing camera angle and view in 3D games or work independently for detailed game control. Left Position - For games using both the + Control Pad and analogue Control Stick. Right Position - For playing games using the new analogue Control Stick and the conventional buttons. Home Position - The classic controller layout for playing a wide variety of games. 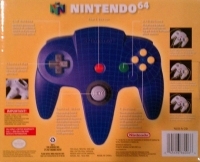 This is a list of VGCollect users who have Nintendo 64 Controller - Blue in their Collection. 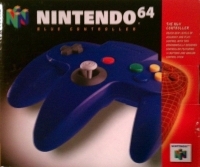 This is a list of VGCollect users who have Nintendo 64 Controller - Blue in their Sell List. 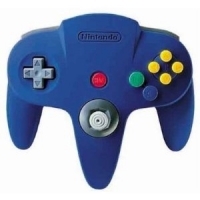 This is a list of VGCollect users who have Nintendo 64 Controller - Blue in their Wish List.